Huh…. What a week it was ! I’ve never been this busy and excited even when Sivaji was released. I was in India that time and also enjoyed my time with my fellow fanatics, but this time it was even better. I never really thought that I would get an opportunity to organize promotional events on my own. It’s quite an interesting story though. Sampath, my co-fanatic was asking me about organizing something here, but both of us were not sure about what exactly can be done. When ‘Kuselan’ audio CD was released, I was pretty excited and wanted to grab a copy of it immediately. When I learnt that the only way to get it is to order it online, I couldn’t wait for the shipping time. So, I decided to call them and check the ways of getting it much sooner. This is how Jayavel Murugan, the US distributor for Kuselan got in touch with me. It was a casual chat and he asked me whether I would be interested in organizing events, for which I said YES even before he completed the question. I was introduced to Mahesh Srinivasan, the joint distributor for Kuselan in the bay area. He wanted to meet me and know about my ideas. I did not have anything in mind until then, but as I sensed that it’s going to be bigger, I started doing my homework. I went to “Tirupathi Bhimas”, a famous restaurant in the bay area to meet Mahesh during lunch break and proposed my idea of conducting a “Kuselan friendship slogan contest”, since the movie is about friendship. As soon as I proposed my plan of action, the sponsors happily agreed to sponsor the entire event. I designed the slogan slip for the contest and also the design of the customized Kuselan T.Shirt. The sponsors got them printed. It was all set for the Kuselan pre-release launch. I was pretty excited about the pre-release launch but at the same time, a little worried since I was a bit doubtful about the response. I got there early along with my friend Venkatesh and started making the arrangements for the event. The slogan contest counter was set up, posters were in place, slideshow was ready, but there was something missing. Aaahhh….. Gotcha! 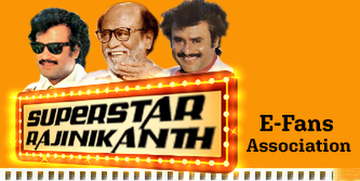 Thalaivar’s huge 25 feet vinyl hoarding that came from India needed to be put on display. It was really tough as we had to suspend it from the top, as we could not provide any cardboard for support. Moreover, the building was not tall enough and as a result, we had to leave some part of it in the ground. But, once the hoarding setup was done, it seemed to be all set for a swift take off. We started explaining the event to one person and then it just spread like forest fire. We didn’t have to do the explanations thereafter. My job was reduced to just judging the best slogans and the other organizers helped me with it. But it was really tough to pause the event for a while and choose the winners for that hour. The kids were enjoying the exclusive Super Star m&m candies. The best part is, people waited to know the results, even after they were done with their dinner. 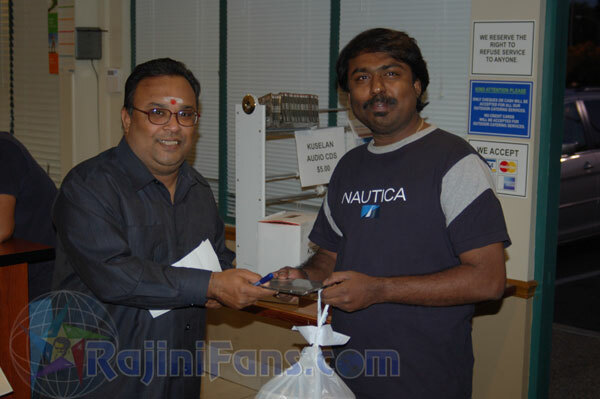 Besides the Ist prize of $20 gift voucher and II nd prize of Kuselan audio CD, the winning slogans were published in rajinifans.com. We also intimated the winners via email, so that they can ask their friends to see their slogan and probably the best chance to show them how special they are to them! People were really very happy and took part in the competition with the elated spirit. Since this kind of a promo event is first of its kind for any Indian movie, am satisfied that I could do something for my thalaivar’s movie.